Posted: Wednesday, November 23, 2016. 9:39 am CST. 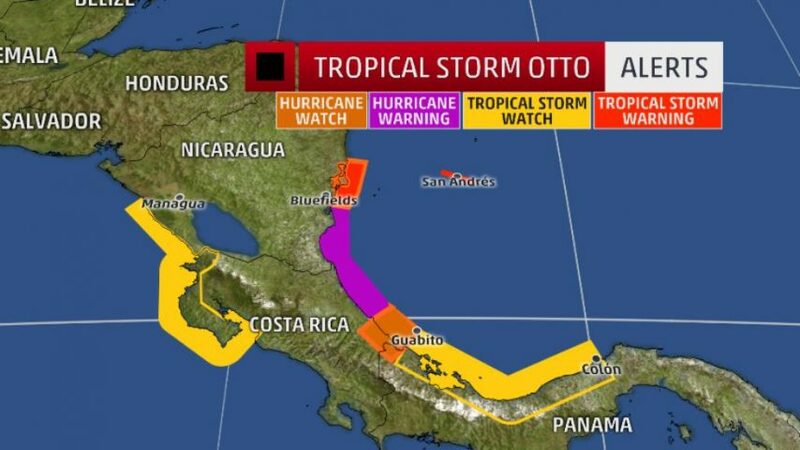 By BBN Staff: This morning Otto was downgraded from a hurricane to a tropical storm. A Hurricane Hunter reconnaissance mission found the central pressure of Otto was about 7 millibars higher than the National Hurricane Center advisory issued two hours earlier. It is expected to make landfall in either Nicaragua or Costa Rica tomorrow possibly as a hurricane. A hurricane warning is in effect along parts of the Central American coast. This could be a record latest-in-season hurricane landfall in Nicaragua. Otto could be the first hurricane landfall in 174 years of records in Costa Rica. Yesterday, Otto became the seventh hurricane of the 2016 Atlantic hurricane season and it is about 24 hours away from an extremely rare late November landfall in Nicaragua or Costa Rica, posing a danger of flooding and mudslides in parts of Central America. A hurricane warning continues from Limon, Costa Rica, to Bluefields, Nicaragua. A hurricane watch is in effect for the coast of Nicaragua north of Bluefields to Sandy Bay Sirpi, and for the coast of Costa Rica south of Limon to the Costa Rica/Panama border. This means that hurricane conditions are possible here. According to the National Hurricane Center, tropical storm conditions in the hurricane warning area could set in as soon as overnight tonight or Thursday morning. Otto is moving slowly west-northwestward, and is now less than 225 miles east of the coast of Nicaragua, as of this morning. Tropical storm-force winds currently extend up to 70 miles from the center of circulation, making Otto a small tropical cyclone. The storm is expected to speed up its forward motion a tad before landfall, as clockwise steering flow around high pressure building to its north will send this system westward toward the coast of Nicaragua or Costa Rica.